Walks 146 and 148 weren't recorded. Walking through Sulham Wood, near Pangbourne. 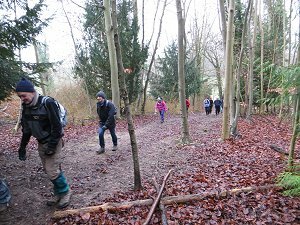 Fifteen of us, including a couple of newcomers, gathered in the Pangbourne Village Hall car park on a rather cold and grey morning for our first walk of the year. 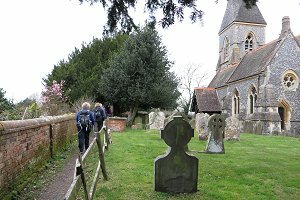 We set off through the village and onto a footpath that ran parallel with the River Pang before joining one of the Berkshire Circular Routes. I can't find any information on the Berkshire Circular Routes even though they've appeared on Ordnance Survey maps of this area for many years. Anyway this one took us across fields and up into Sulham Wood. It then took us through Mosshall Wood and back out into open fields to Vicarage Wood on the outskirts of Tilehurst. The route then doubled back to Sulham Wood, where we stopped for our picnic lunch, sitting on some fallen trees. Crossing the River Pang at Tidmarsh. The picnic over, we followed the route to Tidmarsh, crossing the River Pang before stopping for a drink at the Greyhound pub. 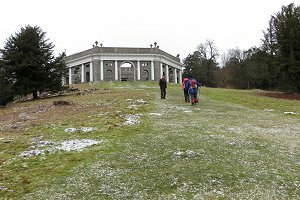 Suitably refreshed, we left the pub and the Berkshire Circular Route in favour of a longer route on footpaths through Tidmarsh and then through Pangbourne College. 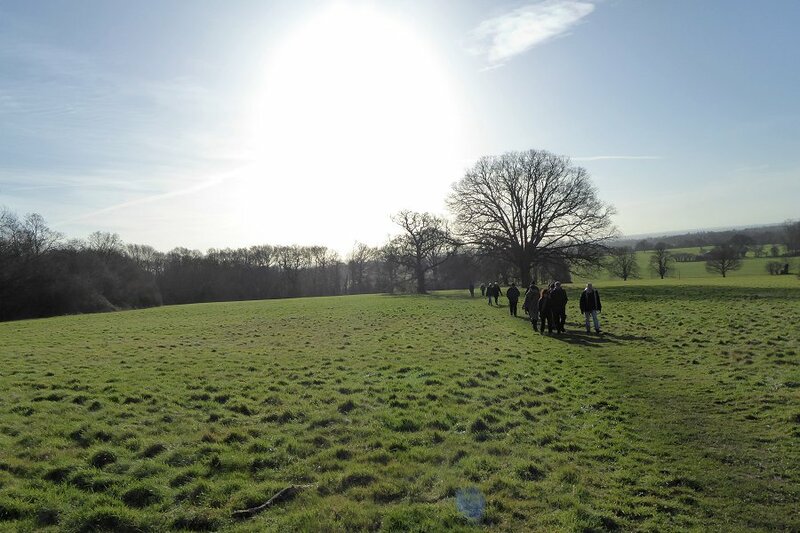 Leaving the college, we followed the road for a bit before joining a footpath that led us through a couple of fields and into mixed woodland at Berry's Copse. We emerged from the woodlands under a railway bridge onto the A329 Shooters Hill, which runs alongside the River Thames. We followed this back into Pangbourne, passing The Swan pub and the weir across the Thames by Whitchurch Lock. See our route on Bing Maps. Dorney Wood. Not much woodland to see in this part of Dorney Wood. 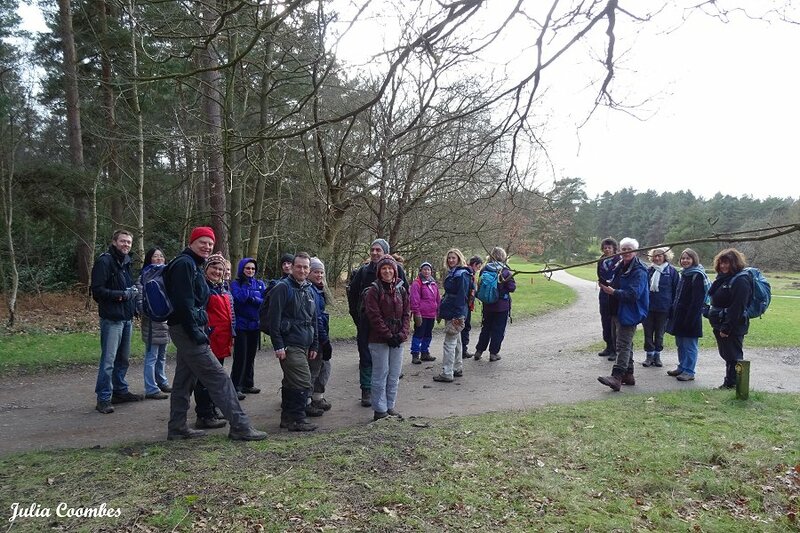 Sunday 11th January, fifteen of us met by the Visitor's Centre in Burnham Beeches for the second walk of the year. Our number included a few newcomers and a few established members that we haven't seen for a while. New Year's resolutions were discussed, which mostly included taking more exercise. We set off south-westerly on Victoria Drive and then on footpaths to the edge of the wood. Leaving the park, we continued west along a footpath through Dorney Wood. This was all open fields and the only trees were in the hedges and field boundaries, so it didn't quite live up to its name at first. 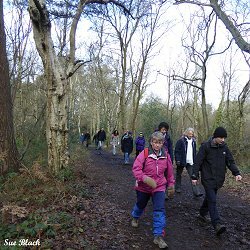 Walking along Shakespeare's Way through Dorney Wood and Burnham Beeches. We only followed it for a couple of miles, which took us through the wooded part of Dorney Wood and back into Burnham Beeches park. We continued to follow Shakespeare's Way through the park back to the Visitor's Centre, but on the way we stopped to look at Hartley Court Moat. Hartley Court Moat in the north-west corner of Burnham Beeches park. This is a near-rectangular moat surrounding the remains of an ancient homestead. 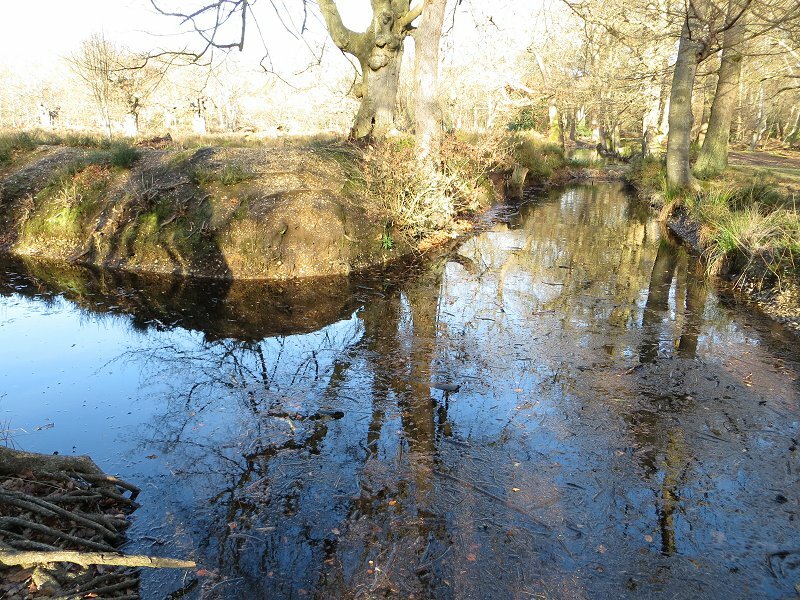 Historically known as Hardicanut Moat it is named after Hardicanut (King Canute's son, and the king of England from 1040 to 1042 AD). The enclosed homestead was thought to have been one of his hunting lodges. After inspecting the moat and the accompanying information board, we completed the last half-mile of our walk and arrived back at the Visitor's Centre at around 12:30. Although it had been a bright sunny morning, the temperature hadn't risen much above 5°C so most of us made use of the café for hot drinks and hot snacks before going home. I recorded our route on my GPS, but somehow managed to delete it before uploading it to the website. Sorry! Walking through The Coombes - SSI woodland in Barkham. On Sunday 18th we had a turnout of twenty-one people for a short walk in Barkham. 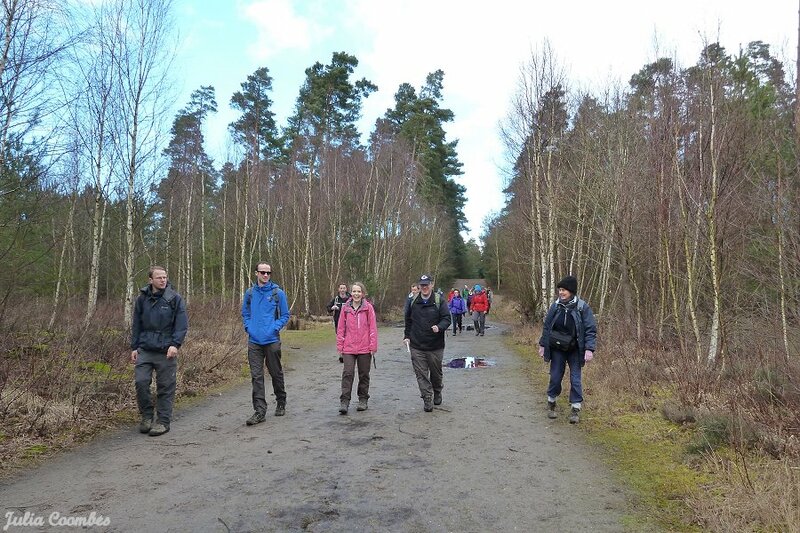 This included three newcomers and a member of one of our neighbouring walking groups. Despite all the forecasts of snow, it was a cold but dry day. When I say dry, I mean it didn't rain, but the ground was far from dry in some places! Walking up Gravel Pit Hill in The Coombes. Another turning and we were following a route through The Coombes, an area of woodland rich in a diversity of plant and wildlife, designated as an area of special scientific interest. 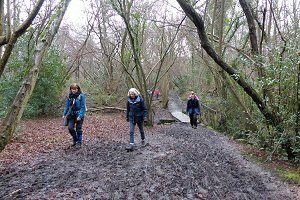 Apart from the rich diversity of trees, we also encountered a rich diversity of types of mud, ranging from a bit slippery to very soggy, as many of the paths were rather waterlogged. The gradual up-hill of the path changed to a steeper climb at the delightfully named Gravel Pit Hill, taking us out of the woods onto Gravelpit Lane, which we followed briefly before taking a footpath that skirted Bearwood Golf Course. In the distance you could see the towers of Bearwood College breaking through the tree-line on the other side of the golf course. Heading east now, we followed Coombes Lane, a muddy track that is used by pedestrians and equestrians alike, but is not suitable for motor vehicles. Eventually the lane became more like a proper road before ending at a crossroads with Bearwood Road. We crossed this road into Sandy Lane, which soon turned from a proper road into a muddy track. 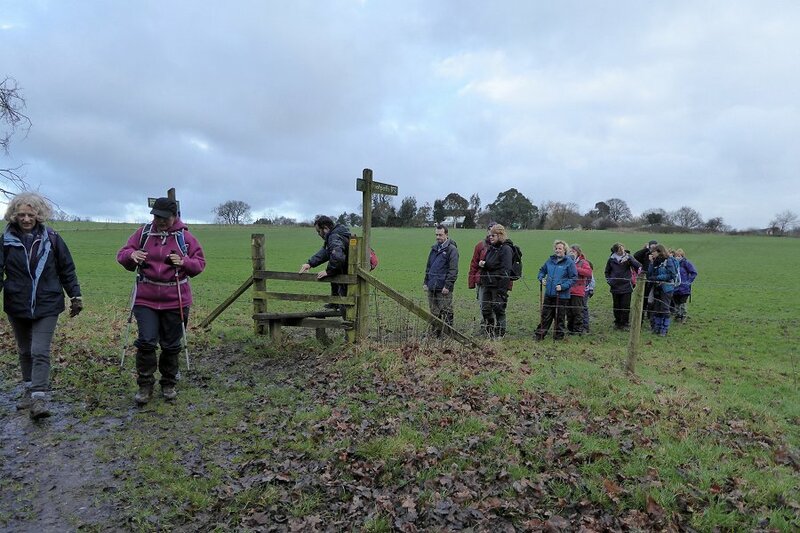 Crossing a stile in Church Farm in Barkham. The walk leader had also booked a table for lunch in The Bull pub, so after peeling off our muddy gaiters, over-trousers and boots, we made our way there. We must have spent nearly as much time in the pub as we had walking, enjoying some excellent food and drink. I'm pretty sure I gained more calories than I lost on the walk, but so what? You only live once! Woodland between Ascot Railway Station and South Ascot. 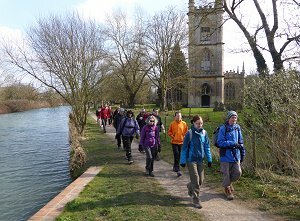 We had twenty-three people on our walk on Sunday 25th January. 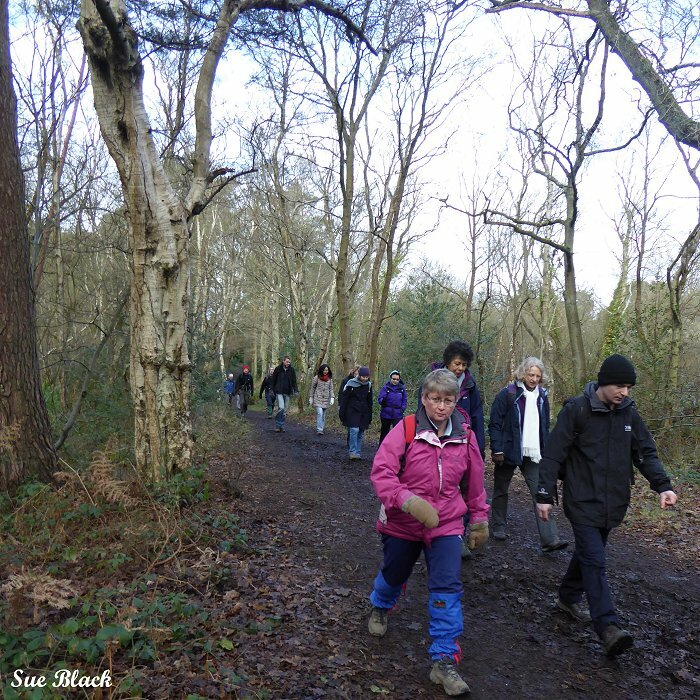 A few of these were guests from other walking groups and a few were newcomers trying us out. This was a linear walk starting at Ascot railway station and finishing at Sunningdale railway station. We set off from Ascot railway station, first going through an underpass underneath the station and then through a few residential roads before taking a footpath through the woods. The path crossed the busy A330 and continued through more woodland before emerging into a residential road in Sunninghill. 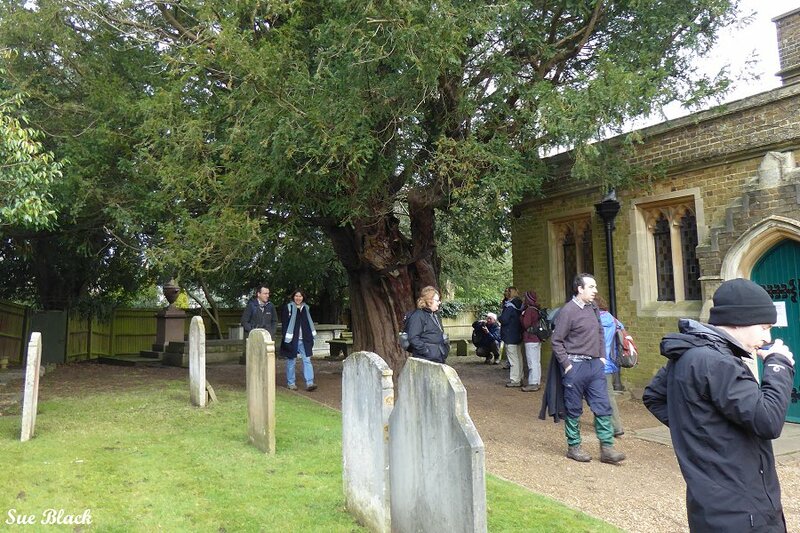 Soon we took another footpath which brought us to the Church of St Michael and All Angels, where there is an ancient Yew tree with a decrepit trunk held together by some sturdy ironwork. The Church of Saint Michael and All Angels. After stopping to look at the church we continued on footpaths, heading north-east, toward Virginia Water. We then followed Mill Lane along the outskirts of Virginia Water to Blacknest Gate on the edge of Windsor Great Park. The plan was to go through part of the park and come out at the car park on London Road, but during the pre-walk the leaders discovered that the car park was being rebuilt and there wasn't good enough access for our walk to go through. So instead we followed the road outside Windsor Great Park until we reached the entrance to Coworth Park. A group photo of us in Wentworth Golf Course. After walking past the rather grand looking Coworth Park Hotel, along a road with an unusually precise speed limit of 9½ MPH, we found some picnic tables by one of the ponds, so we stopped there to eat our packed lunches. The picnic over, we continued through Coworth Park and into Wentworth Golf Course. Keeping an eye out for high-speed golf balls, we walked along footpaths through the golf course until we emerged into residential roads in Sunningdale. With time to spare before our train back, we stopped off at a local pub. However, there was a big function going on at the pub so it took a while to get served and we ended up having to dash for the train. See our route on Bing Maps. The Dashwood Mausoleum on top of West Wycombe Hill. My eyes were met by an even layer of snow over roads and rooftops as I opened my curtains on Saturday 31st January. This was quite localised, and as I drove to the start point of today's walk, the evidence of snowfall diminished to just a feint sprinkling on grassy areas. 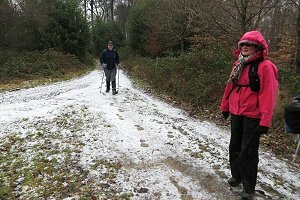 Eight of us gathered in the car park at the foot of West Wycombe Hill for this 8 mile walk that began with the steep and slippery slope up the hill. Pausing at the top to admire the Dashwood Mausoleum (and to get our breath back) we next passed St Lawrence's church with its unusual golden ball spire. Walking through Hearnton Wood on top of West Wycombe Hill. Flakes of snow began to fall as we followed the path through the Hearnton Wood along the top of West Wycombe Hill. Soon we were descending into the Chawley valley, crossing Chorley Road into Chawley Green Farm and through Chorley Farm and uphill again into Chawley Wood. I'm guessing that these places were named before spelling was standardised and now the differences have stuck. Anyway, it was downhill again into another valley and into the hamlet of Piddington. 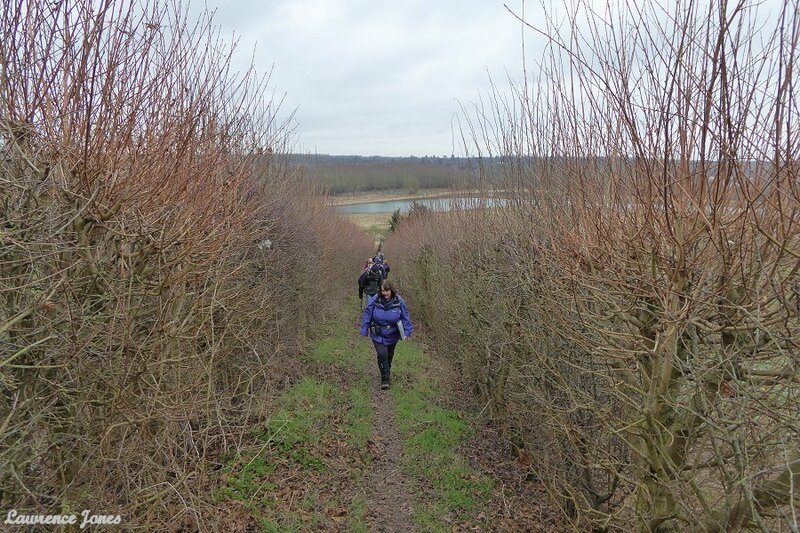 Then uphill again as we followed the steep and narrow Piddington Lane to Wheeler End Common. 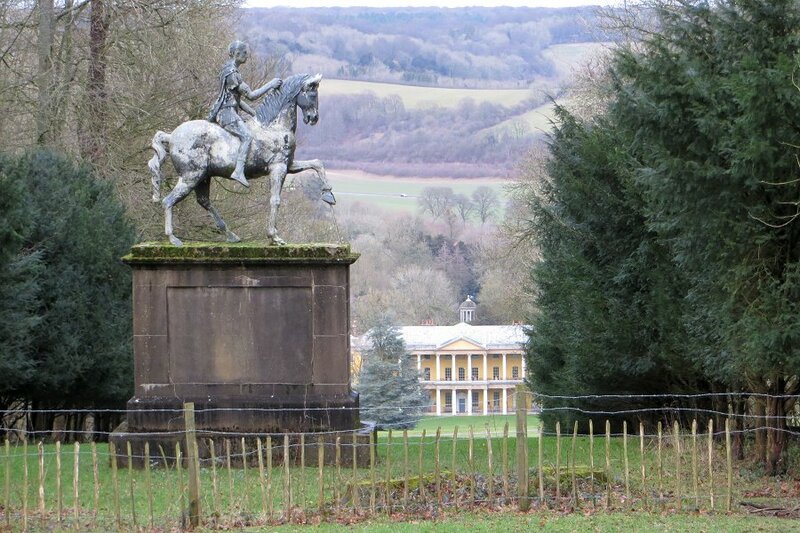 West Wycombe House behind an equestrian statue as viewed from Towerage. We stopped for our picnic lunch on the common. We didn't hang around after eating as it was quite windy on the common and only about 3°C. Next stop was The Chequers Inn to warm up! On leaving the pub, we headed down to Denham Wood and back up again through Great Wood, then down again to Fryers Farm, where we saw a shooting party. We'd heard some gunshots earlier on and now we knew where they came from. We could also hear the occasional roar of the spectators at Adams Park, watching the match between Wycombe Wanderers F.C. and Portsmouth F.C. 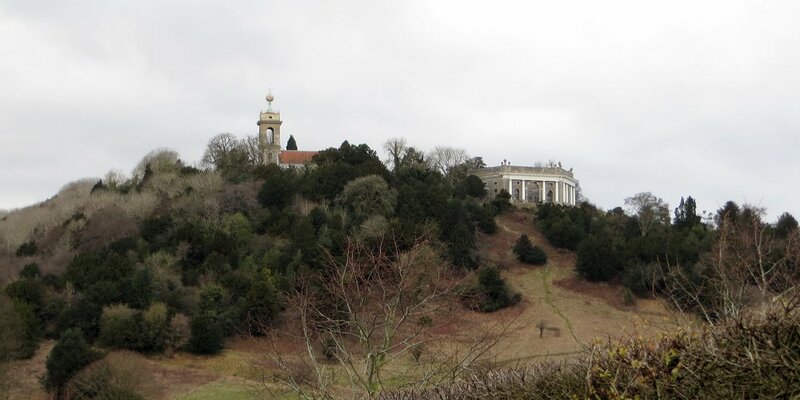 A view of the church and mausoleum on West Wycombe Hill. 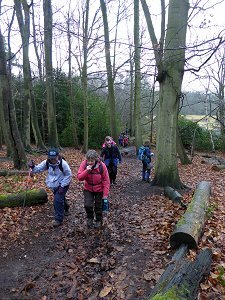 After descending into Hellbottom Wood it was then another steep uphill path to Druid's Hut and then Towerage, where we got a view of West Wycombe House. 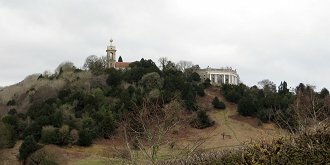 Then we descended from High Wood down to West Wycombe and the car park, getting a view of the church and mausoleum on West Wycombe Hill on the way. See our route on Bing Maps. With 608m (2000ft) total ascents, this walk had been a good workout for us and the physical exercise had kept us warm in the low temperatures. 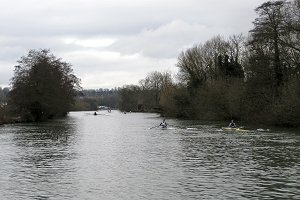 Rowers on the River Thames at Shiplake. 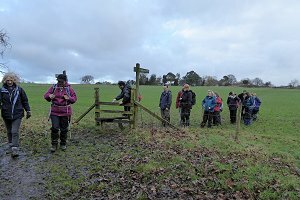 Twenty-three people, including eight or more newcomers, turned up on Saturday 7th February for a rather muddy seven mile walk around Shiplake, Sonning Eye and Dunsden Green. With the sun occasionally peeping out from behind the grey clouds, we set off from the Memorial Hall in Shiplake and went south-west through the village and past the college. Lawrence, one of our regular guests from the Chiltern Weekend Walkers, requested a stop to look around the Church of St Peter's and St Paul's on our way down to the River Thames. 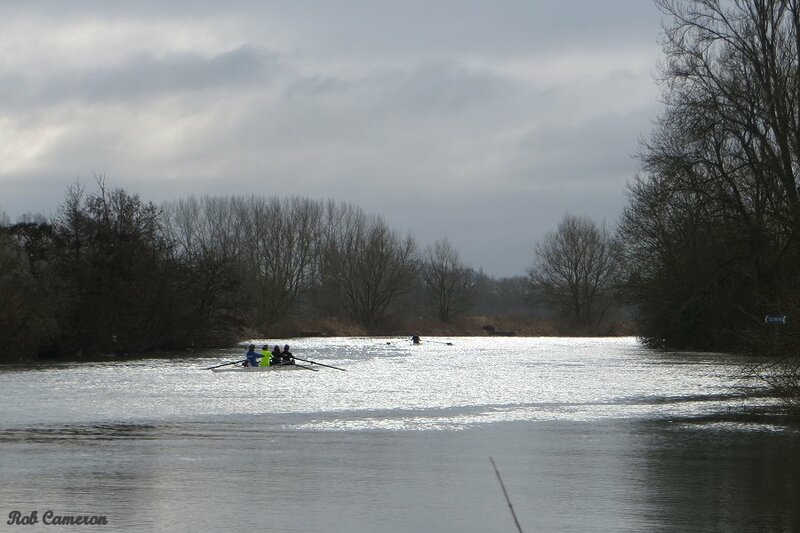 After that, we joined the Thames Path by the Shiplake College rowing club, where we saw a few hardy students out on the river. The road bridge over the River Thames at Sonning Eye. 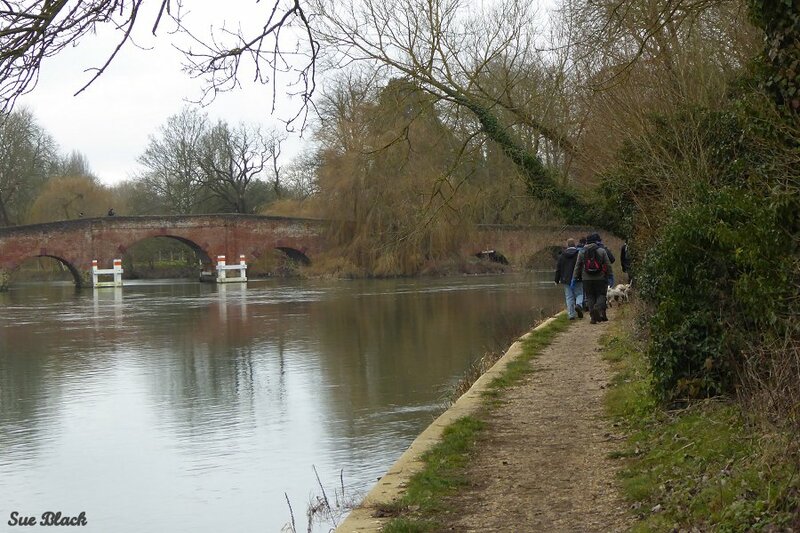 A misty drizzle began as we followed the Thames Path south toward Sonning Eye, but it didn't last for long. Just long enough for some of us to stop and put on waterproofs only to find they we no longer necessary! We reached Sonning Eye and found a pleasant spot by the river for our picnic lunch. It was a little early for lunch but there would be nowhere as suitable before reaching the pub. After lunch we followed a particularly muddy footpath that ran parallel to Spring Lane, at the end of which was the Flowing Spring pub, which due to the shape of the landscape is built on stilts. We climbed the stairs and popped in for a drink. Ascending the hill to Dunsden Green, opposite the Flowing Spring. Suitably refreshed, we left the pub, crossed the A4155 Henley Road and headed up the hill to Dunsden Green. Although the footpath didn't look particularly steep, we gained 55m (180ft) of height in less than 10 minutes, and on the slippery mud it did feel like a mini workout. In Dunsden Green we passed close to the Loddon Brewery. (During the pre-walk, the leader and I popped in and bought a few bottles to weigh down our rucksacks.) 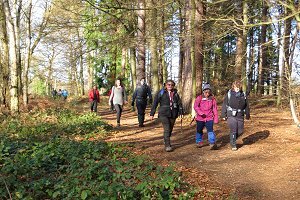 We continued north toward Binfield Heath and then turning east, we passed through Shiplake Copse and Shiplakecourt Farm before arriving back at the Memorial Hall car park. See our route on Bing Maps. The River Thames at Christchurch Meadow. Caversham bridge can be seen in the distance. 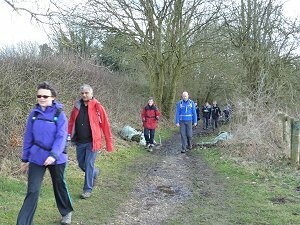 Twelve of us turned up on Valentine's Day for this linear walk along the Thames Path from Reading to Pangbourne. We met outside Reading railway station and started our walk by using the underpass beneath the station and making our way via Reading Bridge into Christchurch Meadows. We followed the riverside path for a short distance until construction works forced us to divert through a children's play area and onto a temporary path, which brought us back to the Thames a bit further along. After passing the War Memorial, we crossed Caversham Bridge and joined the Thames Path heading west past the Reading Rowing Club. A number of canoeists out rowing on the River Thames. 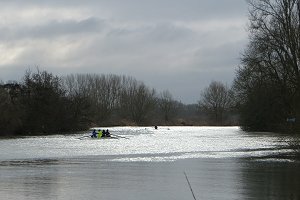 As we followed the river with Reading behind us, the landscape soon turned from urban to rural, but the river remained busy with numerous canoeists quite some way from the rowing club. 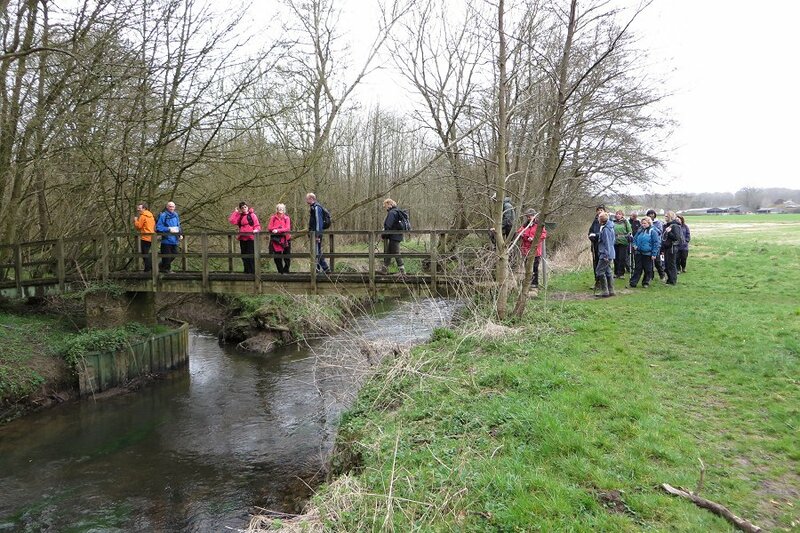 We continued on our way, following the course of the river until we reached Tilehurst. Here the Thames Path leaves the river for a while. 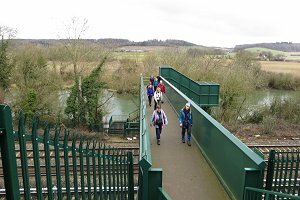 Crossing a railway bridge, we followed the A329 Oxford Road for a short distance before taking a new footpath that led us through woodland to a housing estate in Purley-on-Thames. This new footpath would appear to be the work of the West Berkshire Ramblers group and shortens the walk along the main road. The Thames Path leaves the river at Tilehurst to go inland. Next we navigated through the Purley Park housing estate, emerging on to Mapledurham Drive, which we followed to Mapledurham Lock. Here we stopped for our picnic lunch. Some of us sat on the bank with a view of the weir and water mill, while other sat on benches by the lock. After lunch we re-joined the Thames Path and continued our walk, pausing to put on waterproof jackets as a brief spell of rain light began. 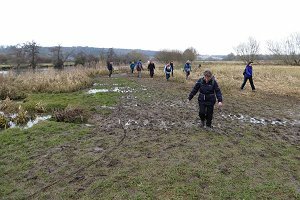 This walk had been relatively mud-free until now, but this last section between Mapledurham Lock and Pangbourne provided a few squelchy experiences to make up for it, but nothing compared to last week's walk. 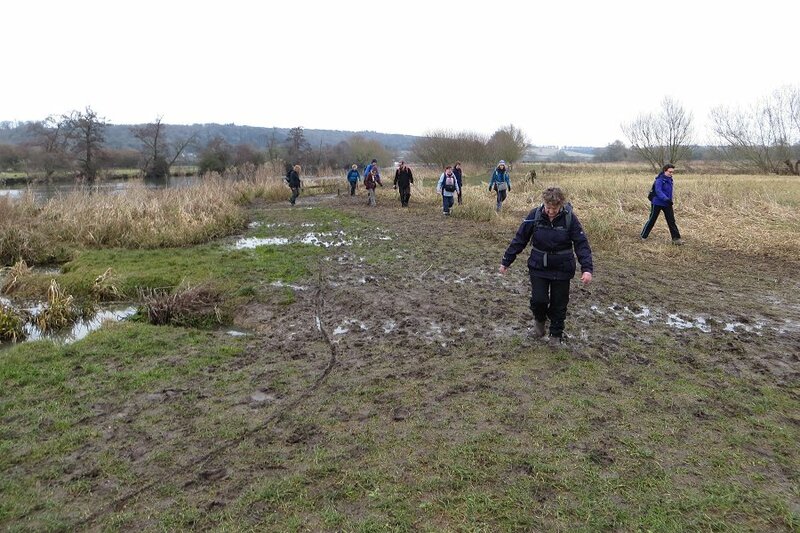 The path got a bit muddy as we approached Pangbourne Meadow. Soon the recently refurbished Whitchurch Bridge came into view, signalling our arrival at Pangbourne. 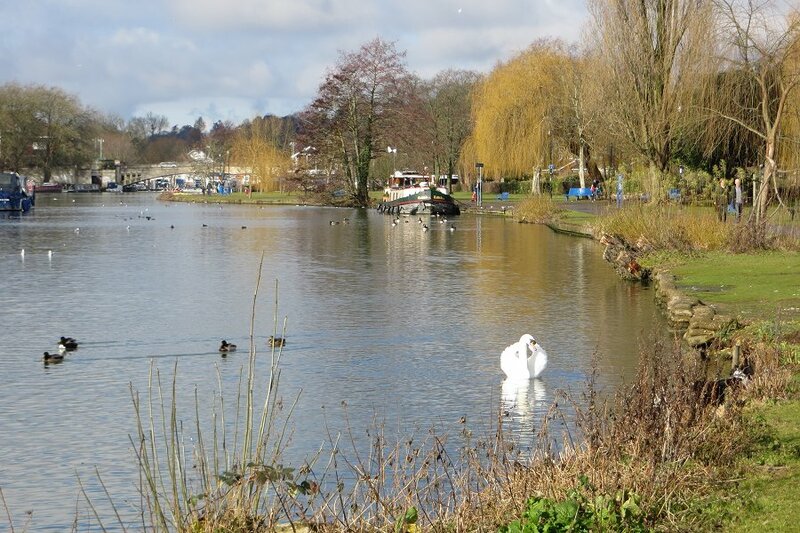 We walked through Pangbourne Meadow and into the village. Crossing the B471 Whitchurch Road, we took a footpath to the railway station, which gave us a view of the weir along the way. 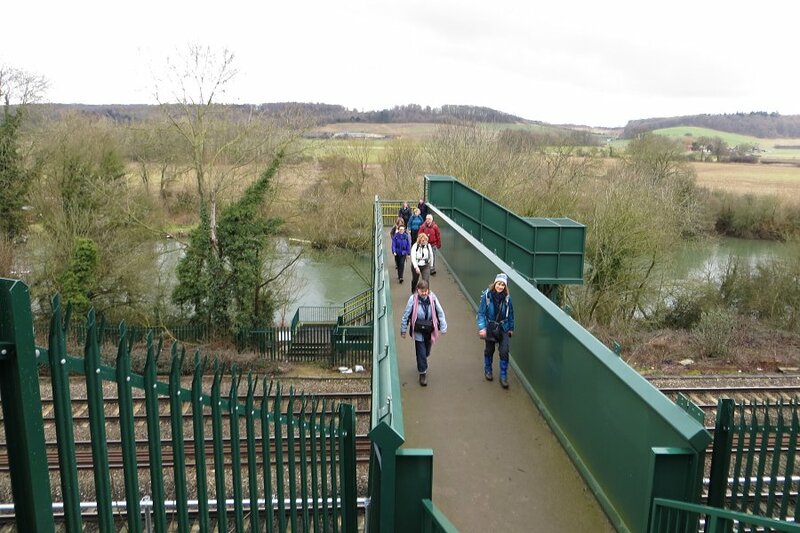 The walk officially finished by Pangbourne Railway Station, with a train journey back to Reading, but some of us wandered a little further up the road to the Swan Inn for a post-walk drink before catching a slightly later train. See our route on Bing Maps. Walking through the Garrick Plantation. This weekend, our group joined forces with the Berkshire Walkers 20s & 30s group for a weekend away in Bath. 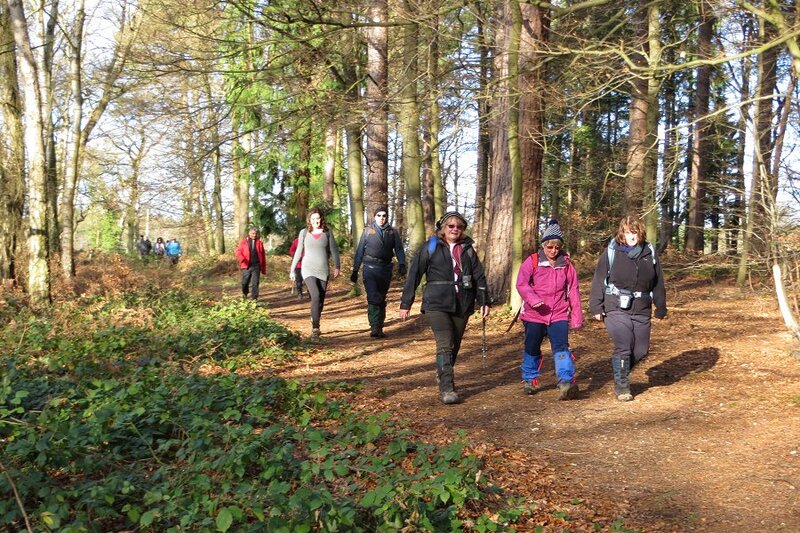 Meanwhile the others joined forces for a local walk around Wokingham and Crowthorne. Julia has provided the following words and pictures. Twenty-three of us gathered for this enjoyable joint walk with our friends from the Berkshire Walkers. 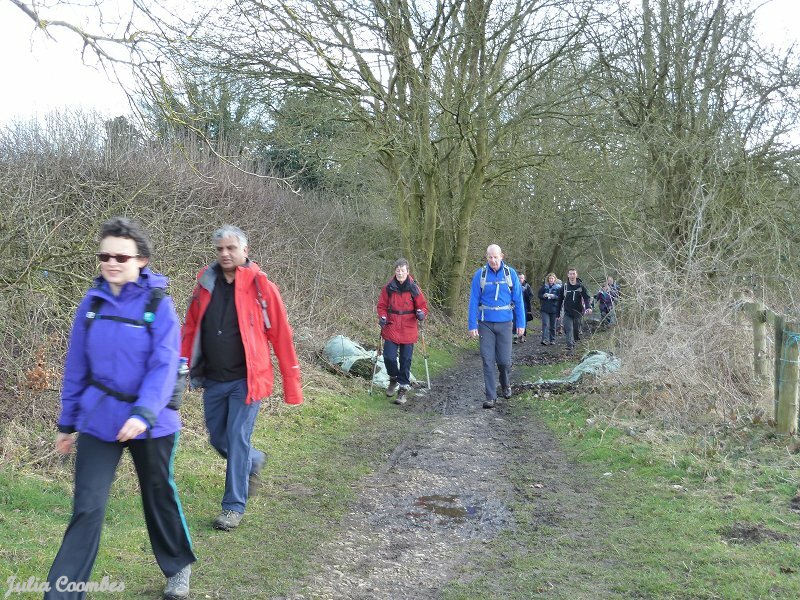 We set out from the station at Wokingham and headed through the outskirts of the town taking the path by the Tesco Superstore which soon took us into the surrounding countryside. Walking along the Luckley Path. We began in sunshine but clouds overhead suggested unsettled weather and it was noticeable how a field full of cows were all sitting down as if they were anticipating a downpour. Sure enough as we approached the Garrick Plantation, there was a bit of a rainstorm - when some of us hastily put on waterproof jackets but fortunately the shower was short lived! We headed on down towards Crowthorne stopping along the way by the attractive Heath Lake for lunch. Luckily the weather stayed dry for the return leg via the East Berkshire Golf Course. 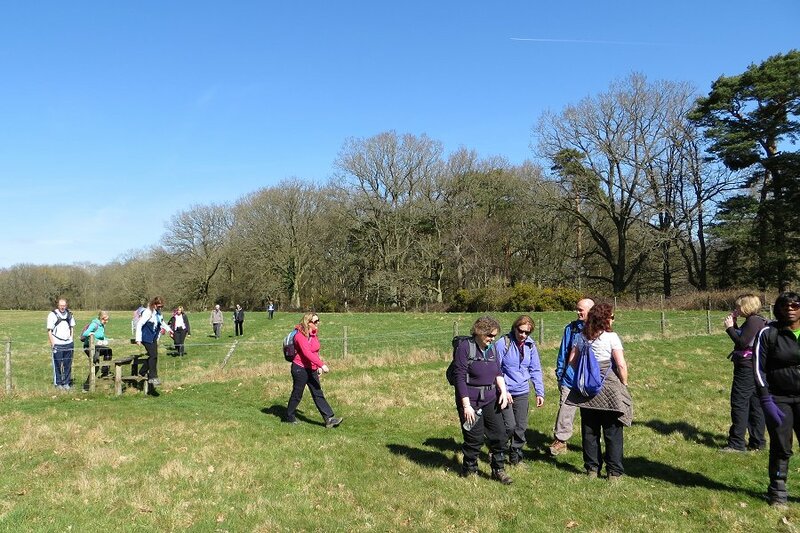 We continued along the Luckley Path past Ludgrove School - as famously attended by William and Harry - back up to Wokingham where some of us stopped for a welcome post walk refreshment outside in the courtyard at The Broad Street Tavern. Leaving Hungerford on the towpath of the Kennet and Avon Canal. 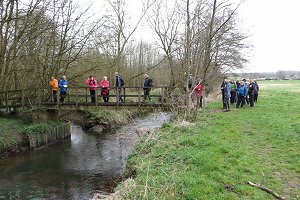 Saturday 14th March saw 24 of us (including several newcomers) gather on a cold but dry day in Hungerford for an 11 mile walk. 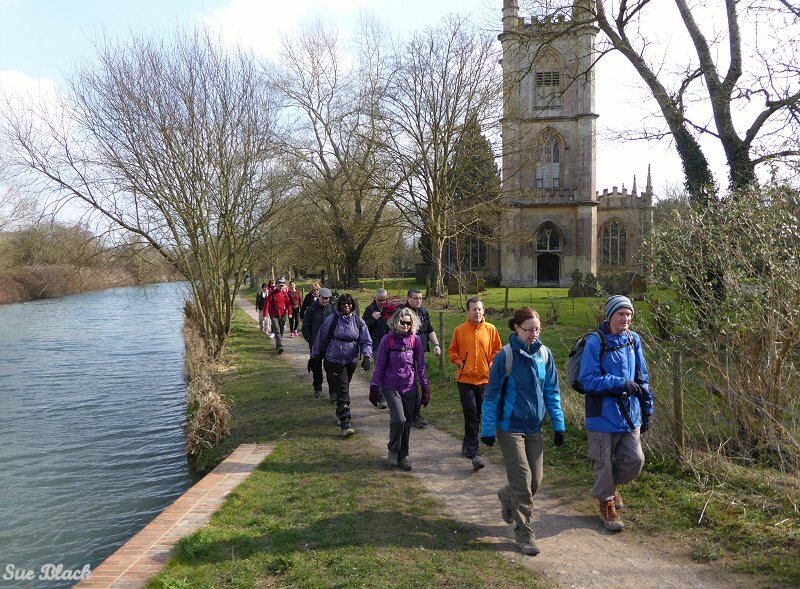 The walk started off from the station, joining the towpath on the Kennet & Avon canal and following it through Hungerford and out to the west. We continued along the towpath, passing several locks, passing under a railway bridge until we reached a road bridge near Froxfield. Here we left the canal and headed off through fields and woodland toward Bagshot. We stopped for lunch in woodland by Kiln Copse, finding a fallen tree to use as a bench. While we were eating lunch, an odd thing happened. A dead squirrel fell from the top of a tree and hit the forest floor with quite a thud, launching a cloud of dried leaves. Feeding the donkeys on a farm somewhere near Templeton. 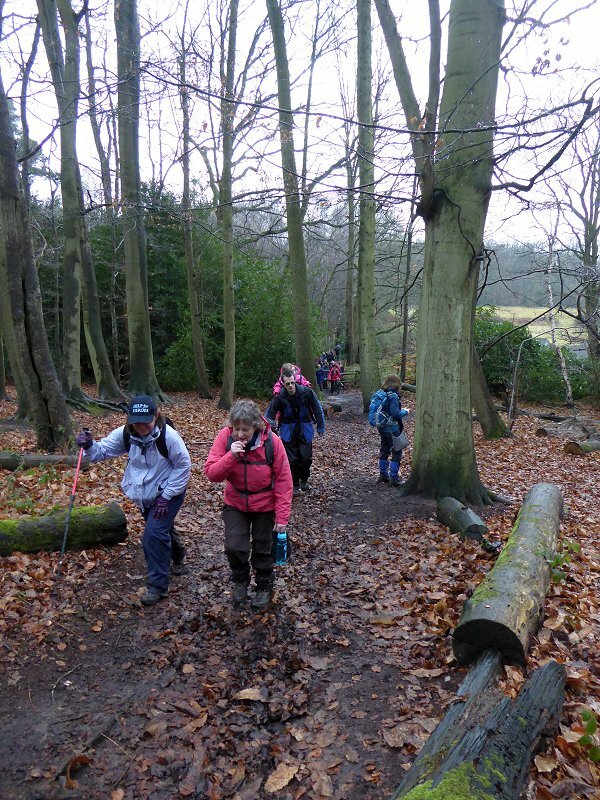 After lunch, we continued through woodland on our way eastwards to Balsdon Farm. Along the way we saw a couple of white donkeys who eyed us with curiosity. 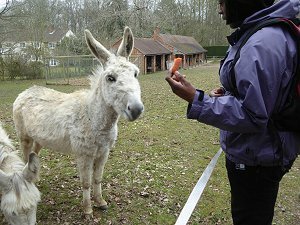 One of our group had some raw carrots left over from lunch, which made an enjoyable snack for the donkeys. From there we went north, through Templeton and then through open fields to Hungerford Port Down before diverting onto the canal towpath again, which we followed back to Hungerford station where we'd started. See our route on Bing Maps. After the walk, some of us stayed on to explore the tea shops and pubs of Hungerford before going home. I'm normally cautious about horses and other large animals, but this one wasn't so intimidating. 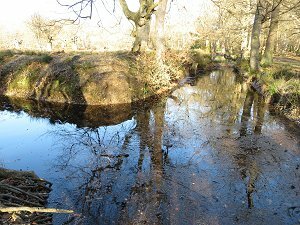 Seventeen of us, including several newcomers, turned up for this easy six-mile walk from Snelsmore Common on this sunny Sunday in March. The walk was led by Jane, one of our more experienced walk leaders, who hasn't been able to walk with us for some time due to an injury she sustained last year. It was good to see her out walking with us again. We set off through Snelsmore Common, heading north through the woodland and then out of the common through farmland to the picturesque village of Winterboure. Heading south-west to the church and then north again through open fields we passed a field in which a tiny pony spotted us and came over to say hello. Crossing Boxford Common, between Winterbourne and Bagnor. 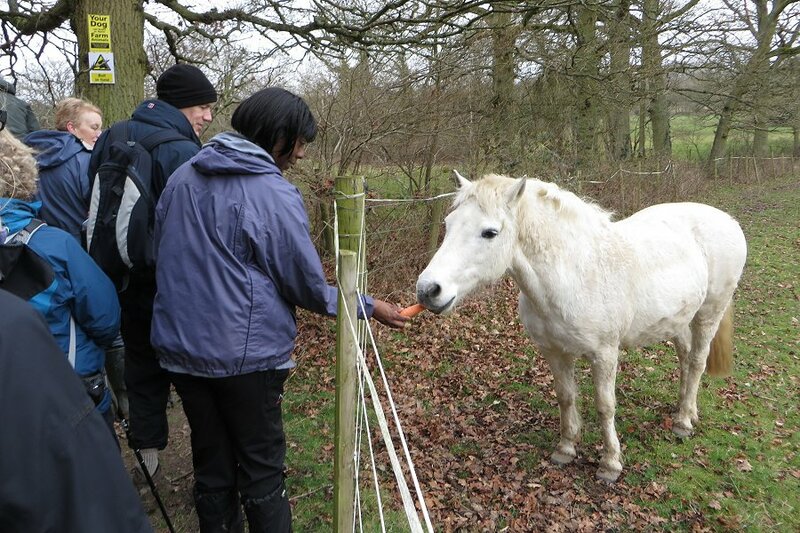 As usual, Pat had some raw carrots in her lunch box and fed one to the pony. 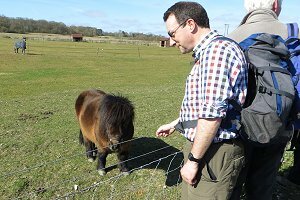 As we made a fuss of the pony, a fully grown horse in a field nearby began to prance about, trying to get some of the attention. Continuing west and then south, we came to Boxford Common, a mixture of woodland and fields. At this time of year, the woodlands are light and airy as the trees are still bare, allowing sunlight through to the snowdrops and daffodils. We could also see the first leaves of the bluebell plants emerging from the ground. Having had a spell of dry weather recently, the woodland paths were much less muddy than usual. 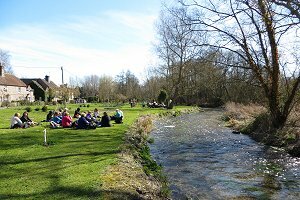 A pleasant spot for a picnic by the River Lambourne, with the Blackbird pub nearby. An undulating route through fields and copses soon brought us to the lovely village of Boxford on the River Lambourne. Here we stopped by the river for our picnic lunch. After lunch, some of us popped into The Blackbird pub for a pint before doing the last leg of the walk. From Bagnor we headed north through more fields and woodland until we reach the edge of Snelsmore Common. Passing through the gate into the common, we made our way back to the car park where we had started. See our route on Bing Maps. By now the common was full of families enjoying the spring weather on this sunny Sunday afternoon. Passing Brimpton Church on our way from Brimpton to Hyde End. Despite the forecast for heavy rain on Saturday 28th March, eighteen of us assembled in the lay-by outside the Pineapple pub in Brimpton Common for this 6 mile walk. We had a few visitors from other groups who'd decided to come along with us instead of going to the walks of their own groups, which is quite flattering. Crossing the River Enborne on our way from Hyde End to Ashford Hill. Passing through Brimpton, we continued west and then south to Upper Hyde End Farm, then past Hyde End House and then through Hyde End Farm. (I think we must have been in Hyde End.) 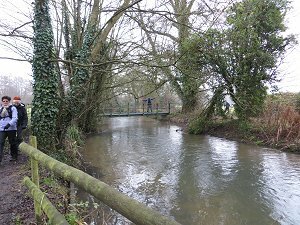 Anyway, we found the River Enborne again, which we followed until we came to a bridge. Crossing the river, we entered woodland and joined an extremely muddy path. This led us to a rather boggy field and finally to Ashford Hill. Although the predicted rain didn't arrive (we just had a brief spell of fine drizzle) our boots certainly got wet on this part of the walk. On the way, we saw some horses. Pat of course, had a carrot with her and fed it to one of the horses. This is becoming a regular sight on our walks. 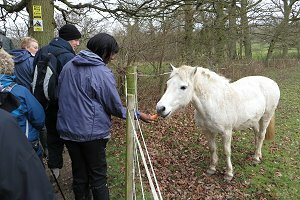 Pat feeding carrots to the horses. Our route then took us through Ashford Hill National Nature Reserve - a mixture of woodland and low-lying meadows - and a gentle hill. It was a bit squelchy under foot until we'd ascended the hill. Then we left the Nature Reserve and passed through farmland again, including a field of miniature ponies. We've seen a few of these on recent walks. Before long we were back at Brimpton Common and the lay-by where we'd started. (See our route on Bing Maps.) With the walk finished, we each had a choice to go home or stop off at the pub. Most of us stopped off at the pub - some just for a drink and others for a pub lunch.